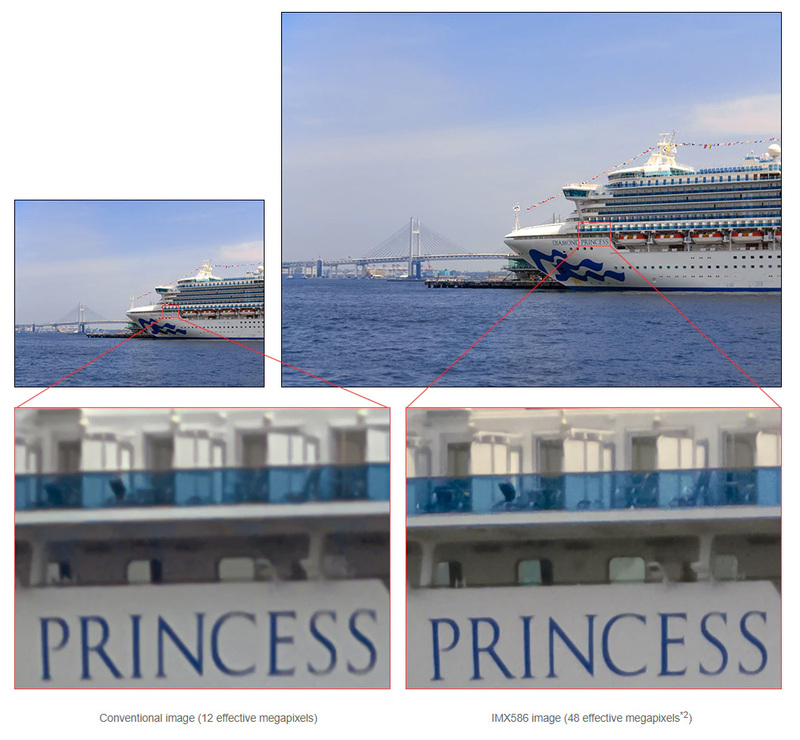 Sony has introduced a new smartphone image sensor today and, looking at the IMX586’s impressive spec sheet, the new chip could help boost smartphone camera performance further in the next generation of high-end devices. The sensor combines two key technologies: very high resolution and a ‘Quad Bayer’ color filter pattern to offer a series of clever processing modes. With its 1/2″ format (6.4 x 4.8 mm) the stacked sensor is at the large end of the spectrum for smartphone cameras: nearly twice the size of a typical 1/3″-type chip. This allows it to squeeze 48MP onto its surface, but still requites a comparatively small pixel size of 0.8 μm. The IMX586 is not just about pixel count, however. It comes with a Quad Bayer color filter array in which every 2×2 pixel array has the same color filter. This allows it to offer several ways to process its data, depending on the conditions. In low light image data from the four pixels in such an array is merged and processed as one single pixel, resulting in a reduced 12MP image resolution. According to Sony, low light performance is comparable to large 1.6μm pixels. In bright light the image signal processor can make full use of the sensor’s 48MP pixel count, however, and capture high-resolution images or use the abundance of captured image data for high-quality digital zooming. This requires processing to convert the ‘Quad Bayer’ data into an approximation of what a 48MP Bayer sensor would have captured. It’ll be interesting to see how well this does. Sony’s write-up seems to allude to a third way of using the data. It talks about the sensor being able to display up to four times the dynamic range of conventional products. We suspect this uses the system Sony uses on its IMX294 chip, where alternate pixels are switched off, mid exposure, protecting highlight capture while still recording full shadow detail. The Quad Bayer pattern would lend itself particularly well to this. This three-mode approach to offering better performance in low light, higher DR in high contrast situations or high resolution when there’s plenty of light may remind some readers of Fujifilm’s Super CCD EXR technology, with which there are some obvious parallels. As usual we don’t know when the new sensor will see the light of day in a production smartphone, but the Sony Xperia XZ3 which is expected to be launched at IFA in September looks like a good candidate. Given Sony is the biggest sensor provider to the smartphone industry we should sooner or later see the IMX586 in non-Sony smartphones as well.